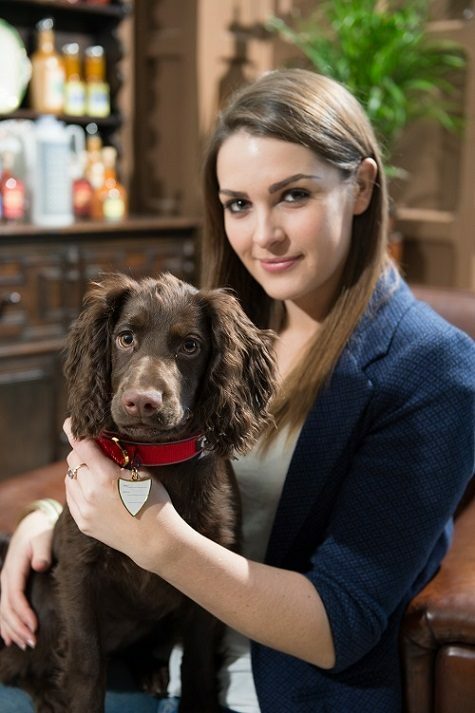 Anna Passey is best known for playing the ever complex Sienna Blake on Channel 4's soap opera, 'Hollyoaks'. Love her or loathe her, she's definitely taken the show by storm and as such was nominated at the 2014 National Television Awards for 'Best Newcomer'. With story lines on screen gripping households up and down the country, Kim O'Meara caught up with Anna to find out all about what's next for Sienna and meet her dog, Scout! Scout is a 16 week old chocolate Cocker Spaniel and she's absolutely mad as a box of frogs (laughs). She's our family dog and we brought her home just before Christmas and for the first couple of weeks she was so quiet and subdued, she never seemed to miss her siblings and didn't make a peep. After the first couple of weeks, oh my goodness, she started getting more confident and she's just bonkers! We have a big farmhouse and lots of surrounding fields so it's perfect for a lively dog like Scout, and we have horses so she loves to investigate what they're up to while chasing the birds. We were a big cat family really until I was around 12 years old when my mum and step-father finally agreed we could get a dog which was when we got Charlie, a Westie, who sadly passed away three years ago. My mum was surprised how quiet it was at home without a dog. When I left to go to University my mum was left with Charlie and used to take her everywhere with her, so she really felt it. I would love to get a dog myself but with my filming schedule it's been so full on it wouldn't be fair so I love popping home whenever I can to see her. You play Sienna Blake on screen in 'Hollyoaks' and well, what a time you've had. From kidnapping Tom Cunningham and getting Nancy Cunningham sectioned so you could steal her husband, you then faked a pregnancy to him, and after being exposed you assaulted Nancy so were arrested before being sectioned. Has it been fun to play someone quite so complex as a character, because for all her faults she does have a vulnerable side as we're seeing now doesn't she? As an actress I don't think you can ask for much more than to play a baddie. Sienna has the excitement of that combined with her vulnerable side, I love being able to play both sides of the card. I think there's a lot of history to be unearthed that will will explain a lot about why she is how she is. Your on screen dad is quite a character (played by Jeremy Sheffield) so the coming months are probably also going to be just as gripping. What's next for Sienna? I really think this will unfold in a way that will be so interesting and explain so much, but at the same time as the story unfolds with my on screen dad's girlfriend Maxine (played by Nikki Sanderson), Sienna will be able to identify comparing with how she was brought up and I think the relationship between Maxine and Sienna will be really revealing showing a different side of her character altogether. There's also the missing daughter storyline which still has to grow and whether Sienna will be able to find her. I think that could be really interesting because she'll have more of a mother's role to play. The show has recently been involved in TV campaigns in association with the Home Office about domestic abuse. Do you think 'Hollyoaks' is in a unique position to be able to reach a younger audience to offer advice on situations like this? Since our producer Bryan Kirkwood came back to the show he's brought more older characters to it's not just the university age group, but the show is more about families which I think gives more scope to diversity story lines and delve into issues and problems dealing with them in a more responsible way. We get lots of great feedback, particularly about the domestic abuse storyline, from people who hadn't realised what was going on in their own lives until they watched someone else go through it on screen. You were nominated at the last National Television Awards for Best Newcomer. How did that feel? It was absolutely super, much more than I'd expected. I mean, everyone watches it so it has a huge audience and I grew up watching it. I never thought I'd be nominated, let alone shortlisted. Because to get shortlisted you need a lot of people to vote for you and let's be honest when Sienna came on screens after all she's done, she wasn't the most popular of characters but the writers have given her some great story lines to show more of who she is so I'm grateful for everyone who saw that and who voted. Where would you like to see Sienna in say, 5 years time? (Laughs) I'd love to think she could redeem herself in someway. Regardless of why, she's done some appalling things. But at the same time I'd love her not to loose that darker side entirely. If you prod her every now and again, that craziness could just be unleashed. I'd really like to think she could find happiness. I mean the circumstances were wrong but if you look at how she was with the family unit of Darren and Ethan, she seemed really happy, even if it was someone else's family. So I'd really like to see her settled down. But with her own family. Do you have a motto that you live your life by? What would you say Scout's motto might be? Well, Scout's motto would be to 'live every day to the fullest'. She lives life with a reckless, fearless attitude. Mine would probably be to 'not second guess yourself'. I think whatever job I've done I've always second guessed myself. The awards were a good example, I kept thinking people would find out I was a phoney, but I have to stop myself and tell myself I'm doing good. Stop second guessing. If Scout were a soap character, who do you think she would be and why? I think she'd be a McQueen in spirit, not so much as far as grooming habits go though. She'd most likely be Mercedes I think, she's got the same fearlessness of spirit. Sophie Austin (plays Lindsey Butterfield on Hollyoaks) – (Laughs) I think she'd be a Poodle. She'd definitely be a lap dog type, I've told her she's high maintenance – but worth it. She's going to kill me. Russell Brand – I think he'd be some kind of a shaggy rescue dog type who likes to talk a lot. Jessica Fox (plays Nancy Cunningham on Hollyoaks) – I think she'd be a Parson Russell Terrier. She's bright and she's got the determined spirit of a Terrier. Declan Donnelly – Well I don't really know him but I do find him funny, so for that alone, I think he'd be a Dulux dog. I definitely see Old English Sheepdog because they make me laugh. Big dogs or little dogs – I prefer medium sized dogs to be honest. I'm not really into the small, Chihuahua type dog size mainly because I like to have a proper cuddle so I think Terriers and Spaniels are more my size. Pedigree dogs or cross-breeds – Well Scout is a pedigree dog and I love to see her doing the training she was bred for, but if I were getting my own dog I'd love a rescue mongrel. I have a friend who has a Yorkie cross Jack Russell and cross-breeds have always appealed to me. Days off or days at work – Days at work definitely. I've had a lighter schedule more recently and I'm driving myself mad at home. I feel so guilty that I'm baking and moving furniture around when I don't need to. Handbags or shoes – Definitely handbags all day long! I have a terrible handbag problem. I buy them and don't use them, instead I use the same one all the time. Describe the last time you laughed out loud because of something you saw Scout or another dog do. At your photo shoot actually. Scout is still quite young so she was pretty lively, she loved playing and was getting used to putting harnesses and the jacket on. When we had the jacket on she started running around and looked like a superhero at one point. It was so funny. My mum was there as well and we couldn't stop laughing. It was a fun day. If you had the choice to arrange a dinner party taking three soap characters (choosing from any era, past or present), who would you choose and why? Apart from Hollyoaks I've never watched soaps so I'm going to have to say I'd invite Nana McQueen, because she's just brilliant isn't she – she has a story for every occasion. And finally, this is always a tough question and often requires a fair degree of thinking time but….If Scout had the ability to speak and answer one question and one question only, what would you ask her and what do you think she would say? Well, I'd love to ask her why when we got home after your photo shoot she just sat on my lap as good as gold, yet at the photo shoot she was bonkers. (Laughs) I'd love to hear her answer and if she was pleased with herself. And last but not least, Stackphotography.